Detailed and fantastical story and drawings of grave robber’s son’s research of congenital deformities. The nineteenth century is remembered in American culture as a time of optimism, expansion, and scientific advancement. But one need only glance at the stories of Edgar Allan Poe and Ambrose Bierce, or the grim reality chronicled in books like Wisconsin Death Trip, to realize that there was also an undercurrent of madness, despair, and scientific ignorance. This was especially the case in the medical and psychological sciences, where the antecedents of modern practices jostled for attention with snake-oil charlatans and sincere but misguided obsessives promoting their own pet theories. This unusual debut by New Jersey artist E. B. Hudspeth offers a short fictional biography of a brilliant but unbalanced man and his lifelong obsession with one such blind alley. Spencer Black, son of a “resurrectionist” (a grave robber who sells exhumed corpses to medical students for dissection), grows up to become a respected doctor who specializes in the surgical correction of congenital deformities. Observation of these deformities, and of the even stranger bodies exhibited in traveling carnivals and “cabinets of curiosities,” prompts him to speculate beyond the bounds of accepted medical theories. What if these misshapen anomalies aren’t deformities after all? What if they are, instead, evidence of the human body trying to become something it once was … and might be again? As Black’s theories and experiments grow ever stranger, he faces the prospect of utter rejection, not only by the medical profession but also by the public at large and even his own family. Much of Hudspeth’s story is told indirectly, as if gleaned by an industrious researcher from Black’s scattered personal papers and from newspapers and other public documents, with the darkest outcomes of his obsession only hinted at. 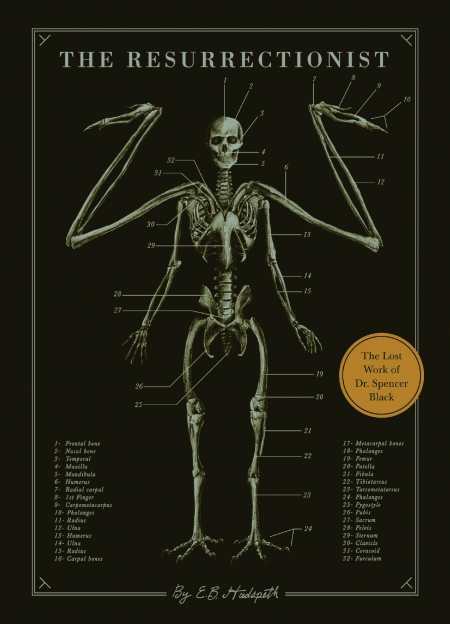 The final two-thirds of the book consists of illustrations purportedly taken from Dr. Black’s single published work, a collection of bizarre anatomical sketches illustrating his theories. These detailed and fantastical drawings will intrigue any reader curious about the hypothetical anatomy of mythical creatures such as mermaids, minotaurs, and harpies. In the context of the story that precedes them, they prompt disquieting thoughts about the extreme lengths to which the fictional Dr. Black may have been willing to go to prove his assumptions, and what—or who—may have served as his models.